The Sikh Coalition, a civil rights organization, was recently asked to present to a group of inmates at San Quentin State Prison in Northern California. Organized by the Asian Prisoner Support Committee, which has a weekly class inside San Quentin State Prison called SQ ROOTS (Restoring Our Original True Selves), the organization was asked to make a presentation about the Sikh community. The class is modeled after Asian American Studies courses, covering topics such as history, culture, personal experiences as well as health and reentry issues. The class is comprised of Vietnamese, Filipino, Cambodian, Hmong, Lao, Chinese, Mexican in addition to Punjabi Sikh men. The presentation included a Sikh awareness talk followed by a discussion on the post-9/11 challenges experienced by the Sikh community, including hate crimes, school bullying, religious profiling and workplace discrimination. It was a unique experience for both the Sikh Coalition volunteers as well as the inmates who noted at the end that they were “grateful” and “thankful” to have learned about the Sikh community and the issues that Sikh Americans were experiencing. It was a moving experience and pushed us to think about restorative justice and the role of forgiveness within Sikhi. Many of us on the “outside” have preconceived ideas about what life is like inside the prison system. To be sure, our few hours inside the prison and interacting with the inmates may not be a fully representative view of prison life. Yet, the warm reception we received by inmates before, during, and after our session was eye-opening; the inmates in our class were very engaged, courteous and collegial. We enjoyed the positive and warm atmosphere exuded by each member of our audience, and were touched by the obvious desire by these inmates to learn more about the Sikh community, and to even empathize with some of the issues that Sikhs in this country have faced. One of the most moving parts of our presentation was when we were asked to provide the opening meditation for the class. We chose to open with a few minutes of simran, and were taken with how each inmate participated fully in repeating “Waheguru” for several minutes with no qualms or hesitation. Beyond our reaction, for the Punjabi Sikhs in our audience, it was the first taste of sangat they’d had in many years of incarceration. As we interacted with our audience we saw who these individuals were today. Had we not been in the location that we were, we might have not even realized that these men were prison inmates. Our experience at the prison brought to mind several stories in Sikh history that demonstrate our Gurus’ ideals of compassion and redemption; we thought of the forgiveness our Gurus showed to those who engaged in criminal behavior, and more so, how our Gurus opened a door for their redemption. In Gurbani, we are reminded constantly that despite sins and transgressions, the longing for the Divine still persists. While there are not large numbers of Sikhs in the prison system, this opportunity did highlight how isolating it is for those Sikhs who are serving their sentences. It was only in 2011 that the State of California agreed to allow prisoners to keep unshorn beards in accordance with their faith [link]. However, inmates are not allowed to tie turbans. In other states around the country, even the accommodation to keep unshorn beards is not guaranteed. The Sikh prisoners that we interacted with noted that they have no contact from the Sikh sangat or the local Sikh gurdwaras – unlike many other inmates who have opportunities to engage with Chaplains, Priests and Imams, and even attend religious services inside the prison. There are also few Sikh resources and materials available to them. We realized that we must not forget those who, like in the times of our Gurus, seek forgiveness and redemption. It is incumbent upon us to recognize that the light of the Divine exists even inside prison walls, and that we should provide the opportunity for those who are seeking this light to have a means to find it. 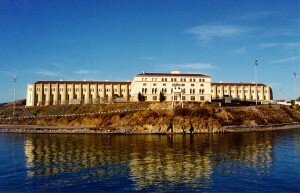 We left San Quentin State Prison reflecting on the irony of our experience. While we have provided such presentations regularly with the hope that through education, we can foster tolerance, understanding and acceptance, on this day, we ourselves were deeply impacted by our experience — indeed, it was an education in understanding and acceptance as much for ourselves as it might have been for our audience.